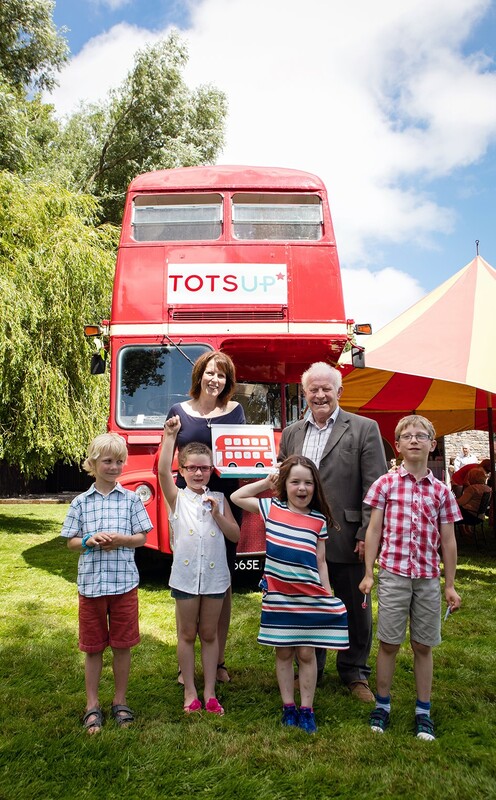 An excited group of young children and their parents assembled on board a big red bus on Sunday (17 July) to celebrate the launch of an innovative new reward chart and accompanying iOS app, which has been brought to market by North Somerset-based fledgling business TOTSUP. TOTSUP, which started out just 18 months ago with advice from North Somerset Enterprise Agency (NSEA), unveiled what is the UK’s first British made combined reward chart and app during an exciting afternoon for guest families at Aldwick Court Farm, Redhill, with on-board photos, treasure trails and cake, plus fundraising for Wallace and Gromit’s Grand Appeal. Three-dimensional and mobile The TOTSUP Big Red Bus is aimed at children aged two to six years old, who are encouraged to move a series of friendly characters from the bus stop onto the bus each time they earn a reward for positive behaviour. Once the bus is loaded with all of its passengers, they can receive a pre-agreed treat from their parents, carers or teachers. The concept was devised by Banwell Mum, Sally Marks, in response to being unable to find a suitably engaging reward chart for her two sons, now aged four and six. Sally, a graphic designer and graphics lecturer, used her skills to design the products and, in the course of development, employed feedback from children, parents and teachers to test and approve the concept. Launched following extensive research and testing and educational psychologist endorsed, the TOTSUP Big Red Bus aims to be simple, engaging and easy for little ones to understand. It also helps with number recognition, simple addition and emotional literacy, as parents can encourage children to name the passengers and talk about the bus journey and where it might be going. Comprising a hard-wearing, high quality, 3D wipe-clean magnetic red bus and a bus stop with nine reusable magnetic passengers and a driver, the product, which comes complete with storage box, retails for £22.95 with the accompanying TOTSUP app, which can be personalised, being downloadable for £0.99. Created, developed and manufactured in the South West of England, it has seen TOTSUP selected to be part of the Made in Britain campaign, which supports and promotes British manufacturing. “Most parents will have come across some kind of star or reward chart but The TOTSUP red bus is different because it is 3 dimensional and magnetic and the unique combination of chart and app means it can be used anywhere.” explains Sally. “It looks good in the home, is great for use at school or nursery or by childcare professionals and is accessible when out and about. “It can be used to end behaviours including tantrums, not wanting to share toys and fussy eating and to support early learning including potty training, teeth cleaning, bedtime routines, tidying and table manners. Sally originally approached NSEA for help in June 2015 and had mentoring support as well as business planning and cash flow forecast advice. This helped in securing a business loan from SWIG Finance. She also took part in a three day Starting In Business course and has since benefitted from attending social media and intellectual property training courses and marketing advice. TOTSUP also raised money to help launch its product through a crowdfunding campaign in March of this year, successfully reaching and exceeding a target of £6,000, which helped to fund the development of the app and the packaging. Earlier this year the enterprise was selected as a member of the inaugural GAIN20 network – an initiative set up by The Growth And Innovation Network (GAIN) at Plymouth University to bring together 20 of the South West’s most innovative and exciting businesses giving them exclusive access to a series of opportunities and support over 12 months. Sally Marks of TOTSUP and Terry Gilbert, a business advisor at North Somerset Enterprise Agency, celebrating the TOTSUP reward chart and app launch with (from left to right): Finn aged 7, Edie aged 6, Poppy aged 6 and Ben aged 7.